A lot of reel for a little price. The Cardinal 100i Spinning Reel features Abu Garcia's premier Stealth Oscillation for a very quiet, balanced retrieve with precision line lay. Built with a lightweight graphite body and rotor, the Cardinal 100i Reel's ultra-tough Everlast Bail System holds its shape through the roughest duty, ensuring long-term reliability. "This is one of the best "cheap" reels i've ever used. I mainly use it for panfish but i've also caught big Mudfish ( AKA Bowfin) and Bass on it with no problems. 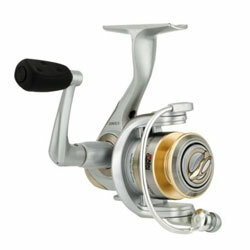 If you want a good, smooth reel for under $50 that will last a while you can't go wrong with this one." "Good product for the money. Love the light weight reel with a sensitive rod. Caught several 10lb catfish and enjoyed the light weight action of the rod and reel." "This is a excellent reel. I have used the larger version for several years without any problems.I have already caught several fish on my new reel and works great ! I also use the Abu Garcia Bait Casting Reel for 30 years and never a problem." "Very good quality reel but with a slight tendency to get loose loops in the line when reeling in which requires you to strip off line until the loop and rewind." According to the general online consensus, where our research is based on unbiased customer comments and user feedback, this is an excellent reel and excellent value for the money. There were only a few negative comments about this reel.